MIM: The Association of Muslim Police in the UK encourages Muslim officers to do Jihad through conversion and try to recruit non Muslims to Islam and more co religionists to the police - in order to continue their Islamist propagation on the taxpayer's dime. The AMP openly proclaims that their mission is to "circulate books and pamphlets about Islam to members of the MPS who genuinely want to improve their knowledge and awareness of Islam and Muslims". Note that this item was on the website Salaam.co.uk which is run by Asaria Iqbal an economist who also runs Jihad and Ummah.org and is known as a 'webmaster for Al Qaeda'. Since 2002 the Metropolitan Police Service has amended its dress code to allow female Muslim officers to wear the hijab. The Head of the Met's Human Resources, Bernard Hogan-Howe, has said: "It is only right that the Met ensures that its uniform is appropriate for all its staff." 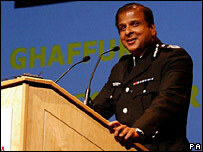 The Chief Constable who was knighted by the Queen could "become the first Asian to head a force. He has already been short listed for the top job in Greater Manchester and the West Midlands." Ghaffur constantly undermines the police counter terrorism efforts by joininsg forces with his co religionists complaining that his colleagues and the governments efforts to thwart attacks are discriminatory, and victimise Muslims . To assist in the creation of a fair and just working environment for all cultural minorities. If you are a Muslim and thinking about joining the Metropolitan Police Service, we can offer you expert support and advice about life in the service and the application and selection process. We also provide further advice and guidance to officers who wear Hijaab or Amaama Sharif while in uniform and circulate books and pamphlets about Islam to members of the MPS who genuinely want to improve their knowledge and awareness of Islam and Muslims. The AMP has been instrumental in ensuring the provision of many relevant facilities to benefit Muslim staff. These include Hijaab for female officers, the Amaama Sharif for male officers, the freedom to wear cultural dress when not in uniform and prayer facilities, to name a few. Membership enquiries are welcome from all members of the MPS. Associate membership is also available to spouses and family members. assist Muslims in the police service to observe their faith, and to promote understanding of Islam within the police service & the wider community. provide a forum for Muslims in the police, and support their religious and welfare needs, with a view to improving their immediate working environment and retaining them in the Service. The AMP is formally recognised by the Metropolitan Police Service. It is active in pursuing faith-friendly policies and has been instrumental in ensuring the provision of many facilities to the benefit of Muslim staff, including Hijaab for female officers, ability to wear Islamic/cultural dress when not in uniform, provision of Halaal food and facilities for Salaah (Islamic Prayer). The AMP is available to provide support and advice to Muslim candidates. Those wearing Hijaab and considering a career in the police service are advised to contact the AMP for further specialist advice. Membership enquiries are welcome from police and civil staff candidates including PCSO's, traffic wardens and cadets. Associate membership enquiries from spouses and family members are also welcome. All enquiries, including media enquiries should be emailed to [email protected]. 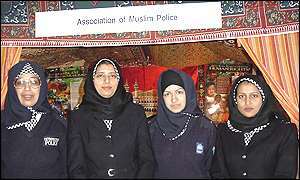 In 2005 the Metropolitan Police hosted a Muslim comedy troupe. Eid is die spelled backwards : Wahhabists and police "working together for the sake of Allah" instead of a "safer London"
The UK's highest-ranking Asian police officer has called for an independent judicial inquiry into radicalisation of young Muslims after the 7 July bombs. 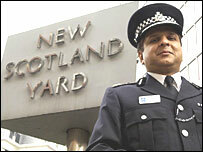 Met Police Assistant Commissioner Tarique Ghaffur said Islamophobia made some Muslims vulnerable to extremism. Tighter anti-terror laws had indirectly discriminated against Muslims, he told the National Black Police Association. Mr Ghaffur said police had to be careful about the consequences for community relations when tackling terrorism. Muslim police officers have welcomed the Metropolitan Police's decision to introduce a traditional headscarf as a uniform option for Muslim women. The Association of Muslim Police hopes the move will encourage into the police Muslim women who had been deterred by the prospect of not being able to cover up in public. The scarf or hijab - which covers the head, neck and shoulders - is worn by some Muslim women in public as a sign of their modesty and faith. 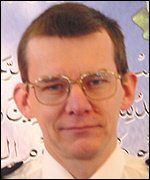 Association chairman Inspector Richard Varley said a proposal for the headscarf was put to the Met commissioner Sir John Stevens in February. "We've had certainly dozens of inquires by potential Muslim female recruits but those inquiries dry up as soon as they realise they can't wear a hijab," he said. He said the latest move sent "a wider message that Muslim values are valued within the Met whether or not the officers choose to take up the offer of a hijab". With Muslims making up to one million of seven million Londoners there should be around 3,000 Muslim police officers rather than the 100 or so now in the force, the inspector added. 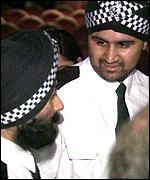 The introduction of the hijab, with the distinctive Metropolitan police black and white check pattern, follows a similar move by the Met for Sikh officers who are allowed to wear a turban on duty. The new addition to the Met's uniform was also welcomed by Sir John Stevens at a conference marking the start of the second phase of the force's diversity strategy. The strategy, 'Protect and Respect' was devised after severe criticism in a report examining the force's handling of the inquiry into the murder of a black teenager, Stephen Lawrence. Sir John said the force had now also signed up to the Commission for Racial Equality's Leadership Challenge, which aimed to encourage organisations to play a greater role in promoting racial equality. The commissioner said he would not be content with merely pledging support for the Challenge's aims. "I want actively to embrace them and develop them further and I know the Metropolitan Police Authority is right there with me endeavouring to make the Met a model of diversity that other organisations would wish to emulate," he said. Sir John said there had been good progress on race issues, but said more needed to be done to meet the Home Office target of 25% of officers from minority ethnic groups. Leroy Logan: "More needs to be done"
The target was just over 5,000 ethnic officers, more than five times the number currently employed, he added. 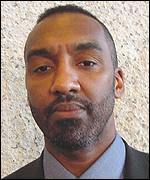 Black Police Association chairman Inspector Leroy Logan agreed progress had been made on race issues. But he said cases such as that of Iranian-born superintendent Ali Dizaei - suspended after allegations of dishonesty and attempting to pervert the course of justice - were a potential block to more ethnic minority recruits. "We've got to make sure that those cases are reduced, make sure that high-flyers, rising stars like Ali Dizaei are not victims of the system," he said. "We are obviously concerned that we have a proper effective investigation to make sure that all cases are resolved because that sets back recruiting the image of the organisation in so many ways and it reduces trust and confidence in the minority communities," Mr Logan added.